If a golden fish granted you the wish to meet anyone and go out for drinks, anyone who ever lived on this planet, who would it be? For me, in the past couple of years, the answer would probably be Richard Feynman. He was one of the world’s most important physicists of the past century. Awarded the Nobel Prize for physics in 1965 for his work on “quantum electrodynamics, with deep-ploughing consequences for the physics of elementary particles”, he contributed to the Manhattan Project building the first atomic bomb, and he’s renowned for his investigation of the space shuttle Challenger’s disaster. Asides from his many accomplishments in the field of science, he was also a great teacher and storyteller. With a remarkable talent of taking extremely complex and complicated systems, those seemingly abstract, and explaining their essence into simple words, while making them fun and interesting, anyone was able to easily understand what he was talking about. Bill Gates calls Feynman “the best teacher he never had” – he discovered his work in a physics-themed vacation that he took 30 years ago, when he watched all of Feynman’s lectures on physics from 1964 and read as many books on the subject as he could. He actually wrote that: “If these lectures had been available to me when I was growing up, I might have become a physicist”. A fun character, driven by an insatiable curiosity to understand all the pieces of puzzle in the universe and how they fit together, Feynman shaped the way I approach life. He taught me how think in a better – and more unconventional way. Feynman was always questioning his assumptions and putting everything to a test, instead of just accepting what’s considered conventional wisdom – this is something that, hopefully, I’m inspiring you to do as well, through the ideas shared in this series of newsletters. Unfortunately, most people focus on knowing the name of something – a social convention, instead of understanding how something works in real-life (educational system incentives aren’t really helping). “What Do You Care What Other People Think?” was published in 1988, the year when Feynman passed away, and is a sequel to the extraordinary “Surely You’re Joking, Mr. Feynman!” (that I got to read last year). Both are collections of stories that cover his whole life and were constructed from a series of transcribed interviews with Feynman – although, while reading them, you might get the mistaken idea that they’re autobiographies. This book is spread into two parts: the first one, “A Curious Character”, is a reminiscence of the people who shaped his personality, with a focus on his first wife, Arlene – a painful story, as they met when he was about 13, and she died after a few years of marriage because of tuberculosis. The question that gave the title of this book is actually taken from one of the letters Arlene wrote to him, as she lay dying of tuberculosis in a hospital bed, while he was working on the Manhattan Project. In the second part of the book, “Mr. Feynman goes to Washington”, he recounts his experience investigating the space shuttle Challenger’s 1986 explosion and walks us through the (fascinating) process of how he discovered what caused the disaster. 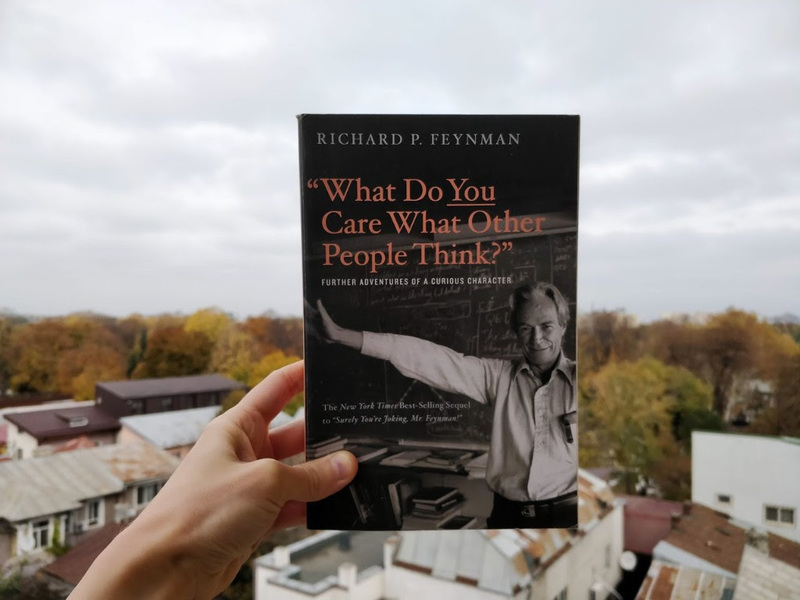 If you haven’t read “Surely you’re joking, Mr Feynman!“, start with that one instead, and only afterwards read this sequel titled “What Do You Care What Other People Think?“. And if I haven’t convinced you, maybe Shane Parrish will – go read his article on FarnamStreet: “The Feynman Technique: The Best Way to Learn Anything“. P.S. this article was an excerpt of our newsletter. If you enjoyed and would like to receive more similar articles, join us.